At last, the rainy season has kicked in! Historically, January is our wettest month in northern California. The vines are now dormant and the soil is ready to take in water. While we welcome the rain, it does come with issues when it comes down fast and hard. First being erosion. 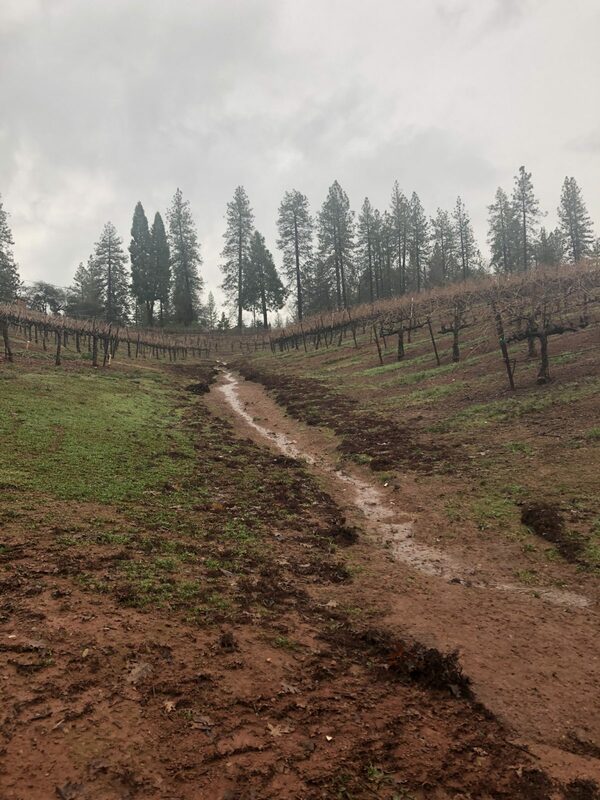 In El Dorado County, it’s hard to find perfectly level ground with grapes on it. In the vineyards of Boeger Winery it is especially steep. The heaviest of rains can easily carve out part of the hillside like you see here from recent rains. The steep terrain did a better job holding on to the soil in the picture below. You’ll notice the purple/reddish tint to the ground. That’s actually a mixture of pomace (grape skins) and grape stems. The stems interlock to form a natural lattice that helps ensure soil remains in place during heavy rains. Also, you’ll notice the line across the hill. Diversion ditches are dug to direct run-off horizontally and minimize erosion. Pruning has to be done during the wet season as well. Cutting back last year’s growth is essential to the growth of next year’s crop. In the wettest of years, crews can be delayed because of the weather and mud. But there’s definitely more positive than negative when it comes to rain! The creeks are starting to flow beautifully. 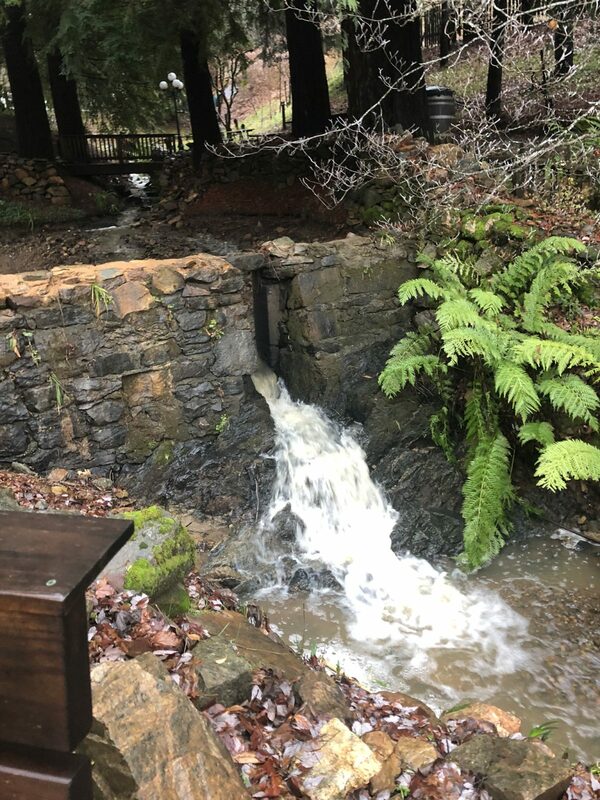 The pond at Boeger Winery, normally full, is emptied during the rainy season to allow maximum flow through the waterway. It was built in 1872 to supply water to the original winery. Other ponds scattered about the property are filling nicely. 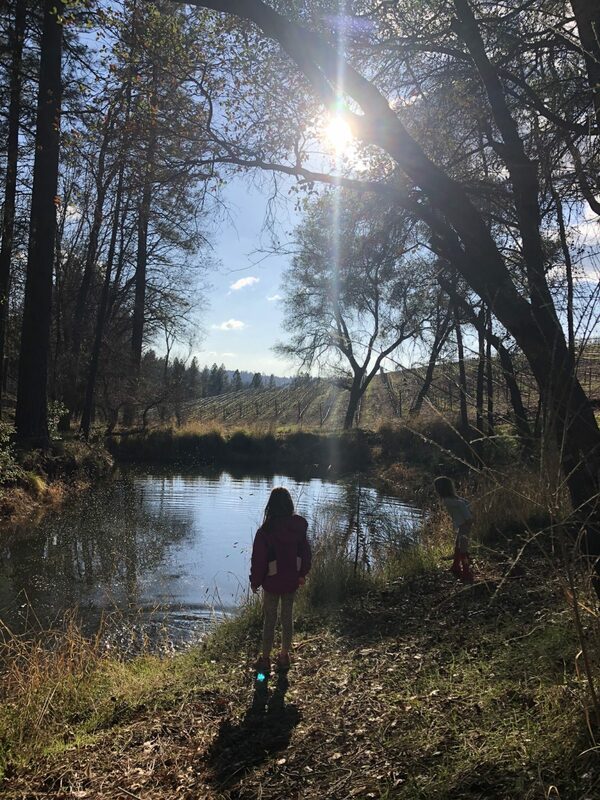 Perfect for my girls to skip rocks when the sun peaks through. The chorus of frogs has certainly returned to the ponds as well. 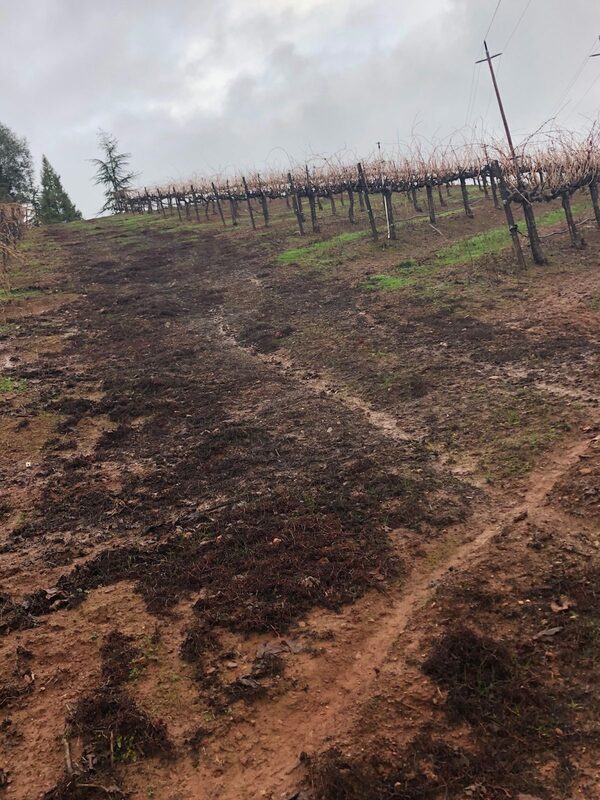 It’s always exciting to see the pops of green grass sprouting in the vineyards. Signs of what spring will bring.